July 19, 2011 Daily Photo. 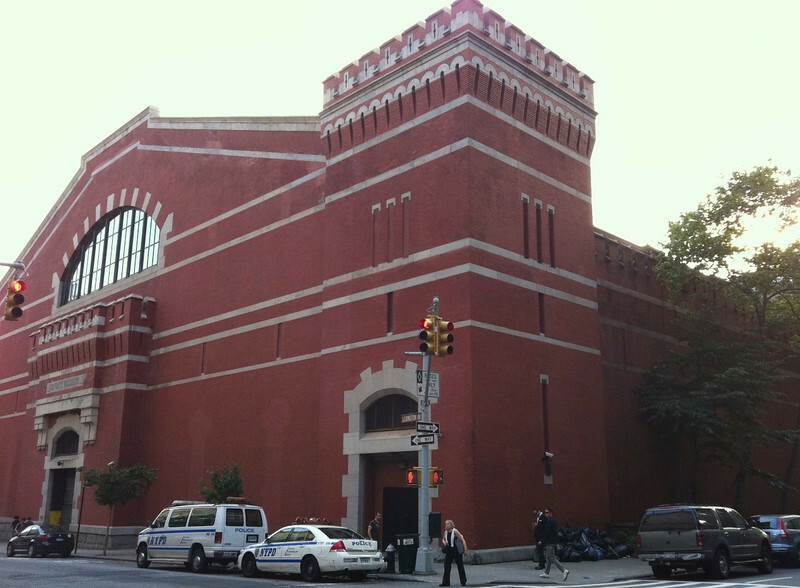 7th Regiment Armory aka Park Avenue Armory. It was built by the city's elite in 1879 who made up most of the New York State Militia 7th Regiment. This Armory was built partly as a clubhouse and partly to protect the elite should riots like those of the Draft Riots of July 13 to July 16th 1863 occur again. It was built like a fortress to fire on "invaders" aka rioters. BTW, the draft riots, which were terrible and resulted in horrible loss of innocent lives by the rioters, was caused in large part because only the poor were drafted. The violence and murders by the rioters was inexcusable, but the well to do could buy their way out of the draft for $300., a sum not available to the average draftee, more likely than not fresh off the boat from Ireland and this use of the poor as cannon fodder hardened their hearts....but I digress. Wonderful capture of that formidable structure -- great information to go along with it too! Great building. Very interesting story and history. Thank you. Wonderful capture and story behind this building. Some of the stories from those days are so hard for me to wrap my head around. I can't believe how people were treated back then (and today as well) but it seems so much more barbaric in those days.